In Pakistan dangerous diseases growing rate increases rapidly in which hepatitis is on number one. More than 70% of Pakistani peoples who lives in cities are under attack by Hepatitis A, B, and C virus. Doctors claims that the drinking water is not pure which is the main reason of spreading Hepatitis virus. Due to shortage of pure water majority of Pakistani peoples currently using disposal mineral water in which Nestle and Aquafina is top on list. Peoples believes that Nestle and Aquafina water is 100% pure but the reality is different. Both of these brands just focused on their water sales except water quality. 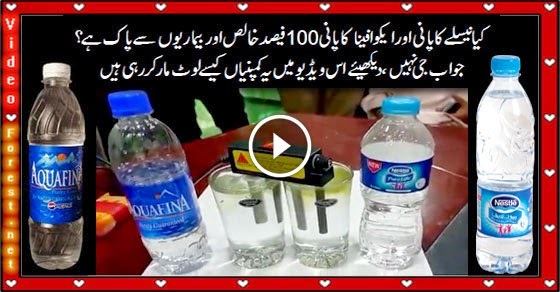 In following video a water purity test conducted in which Nestle and Aquafina minerals water compared with a device called Water electrolyzer(Water electrolyzers provide us with the simple and cheap way to test water quality). Both Nestle and Aquafina minerals water failed in test but Aquafina is little pure as compare of Nestle minerals water. Let's check this video..